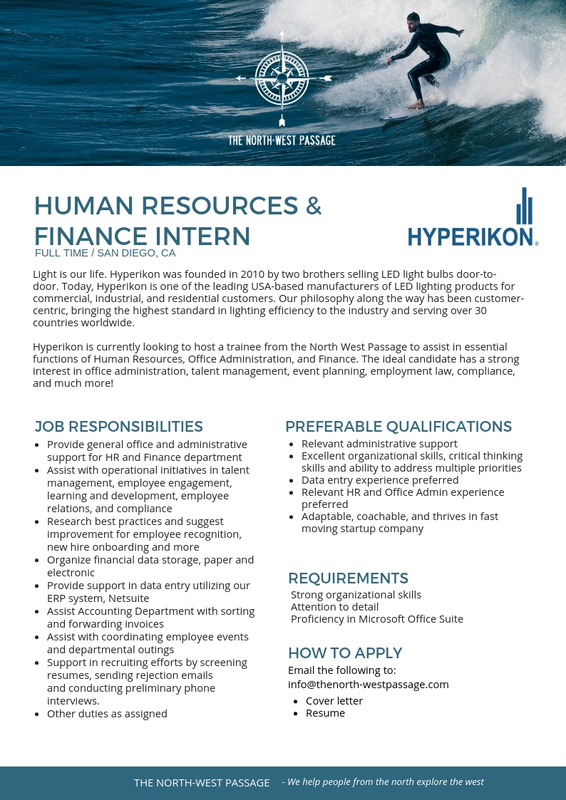 These internships are specifically tailored for Nordic students applying through The North-West Passage and the potential stipends have been negotiated directly with us. To be eligible to apply for these internships, you have to be a full time student at a higher education, such as a University, College or Vocational school and your studies need to relate to the main focus of the internship. Please click here to read up on the eligibility requirements. 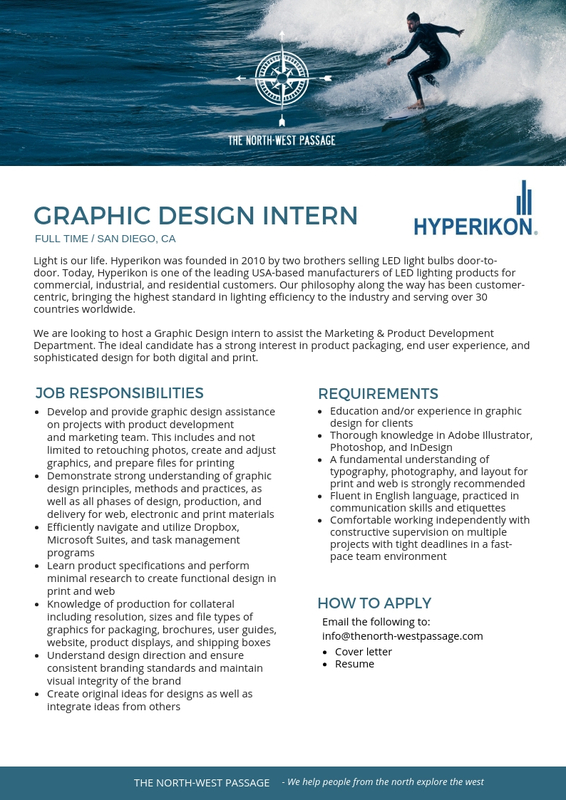 You apply to these internships by sending us your resume and a short explanation to why you want this position. The internships all have different start time, length and potential stipend, so please read up on each position before applying to make sure you are able to adhere to these specifics. Depending on the length of the internship and the amount of the monthly stipend, there will be a different program fee for each internship. The program fee only applies when being offered an internship and you choose to accept the offer. The program fee is to cover the costs of sourcing and negotiating these opportunities to be exclusively offered to Nordic students, as well as the assistance throughout the application process and support while in the U.S.
All internships in the U.S. require that you have a J-1 visa that you can only acquire through a visa sponsor. The North-West Passage is a partner of CIEE, the largest visa sponsor in the U.S., and can help you with whole visa process. The visa cost is separate from the program cost and the pricing depend on the length of the visa and can be seen here. Project EVO exists to help creatives and entrepreneurs find their flow. Our goal is to help you understand who you are (psychology), what you do best (behavior), and help you create the unique roadmap you need to thrive (flow). When we have this unique roadmap, we know where to focus. When we have focus, we can tap into flow. And when we’re in flow, we can experience true freedom and fulfillment. One of the fastest growing & innovative companies in personalized wellness in San Diego, CA. Listed Simply has all the tools needed to sell your home quickly. Our listing coordinators prepare homes for sale, marketing department will spread the word and our contracts team will walk through escrow. We've got it all covered! 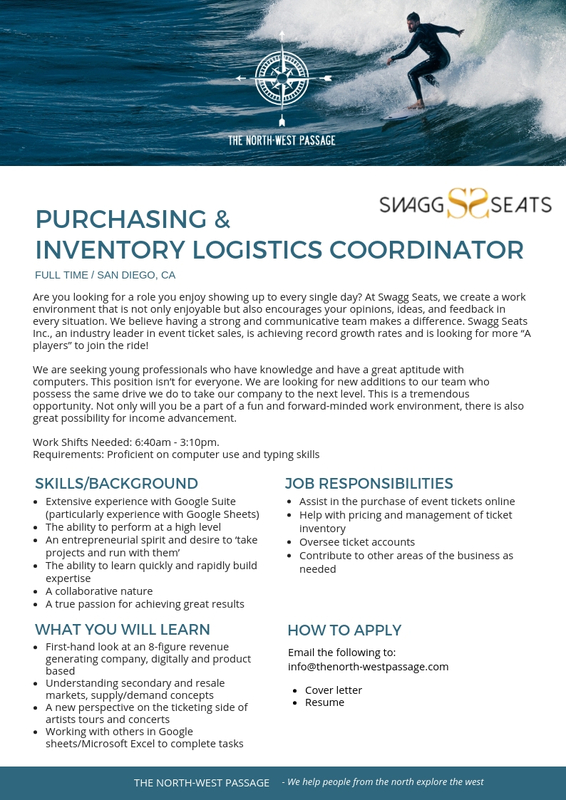 Swagg Seats Inc., an industry leader in event ticket sales, is achieving record growth rates and is looking for more “A players” to join the ride! We are seeking young professionals who have knowledge and have a great aptitude with computers. This position isn’t for everyone. We are looking for new additions to our team who possess the same drive we do to take our company to the next level. This is a tremendous opportunity. Not only will you be a part of a fun and forward-minded work environment, there is also great possibility for income advancement. For Purchasing and Logistics Position, we are looking for both Current Students or Graduates. - Stipend ($500-$1000). 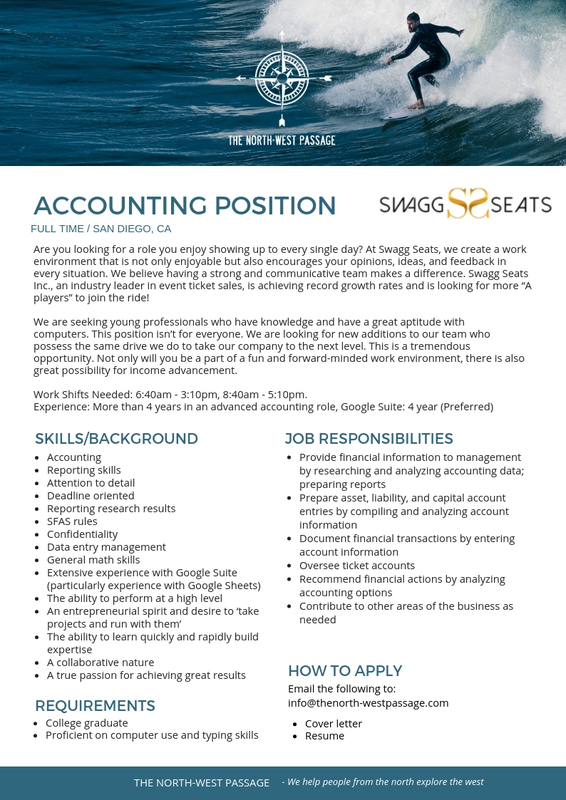 For the Accounting Position, we are looking for a Graduate - ($1500-$2500). Accounting Position: CLICK HERE TO READ FULL JOB AD! Purchasing & Logistics Internship: CLICK HERE TO READ FULL JOB AD! *Applicants are reviewed as we get them, so please submit your application as soon as possible. At Vaco San Francisco (VacoSF), we're located smack dab in the mecca of technology innovation, surrounded by the most brilliant and creative minds in the world. We want to proudly present our unique opportunities that will take you far in your future career. 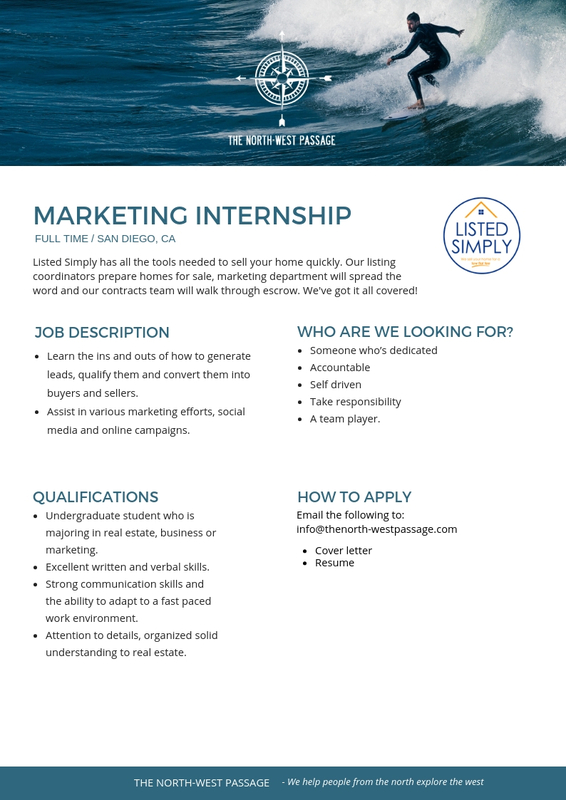 We are looking for motivated students within the marketing, advertising, business field to join our great team in the beautiful Bay Area San Francisco. You will be employed at Vaco, a nationwide consulting company that is hired by world known brands for different large projects. The project client that we consult for is a multinational technology/e-commerce company headquartered in Mountain View, CA, and is the global leader in internet search and advertisement. The project team is located onsite a client campus in the heart of Silicon Valley. CLICK HERE TO READ FULL JOB AD! *Must be able to speak English and at least one of the languages: Norwegian, Finnish, Danish, Dutch or Japanese. Positions for Swedish speaking interns are currently filled, but will open up in the fall. experience, be proficient in at least one programming language, and understand basic data structures and algorithms. Intern with some experience with React. Data science & data visualization experience a plus. 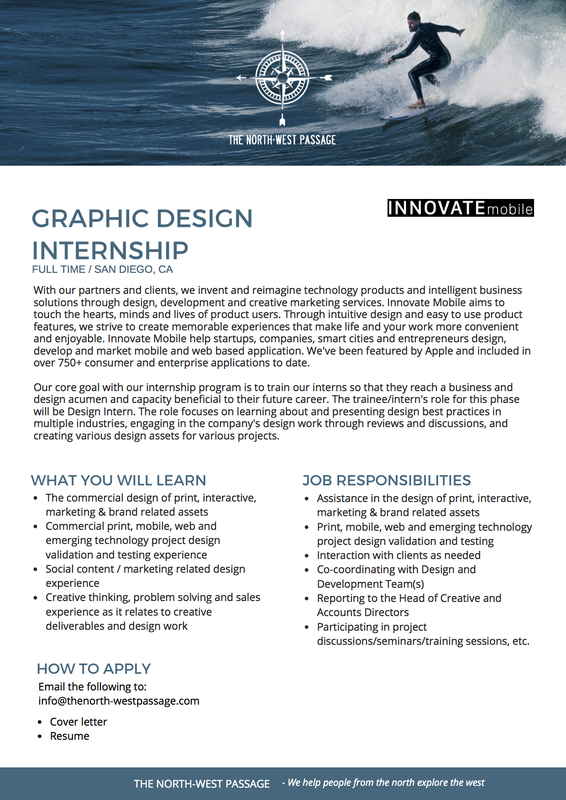 Front End Web Development Internship: CLICK HERE TO READ FULL JOB AD! Phyton Developer Internship: CLICK HERE TO READ FULL JOB AD! ICC Hawaii strives as the leading language school in Hawaii. With quality academic programs, a diverse student population, and welcoming staff, ICC Hawaii aims to provide students a memorable experience while studying in Hawaii. 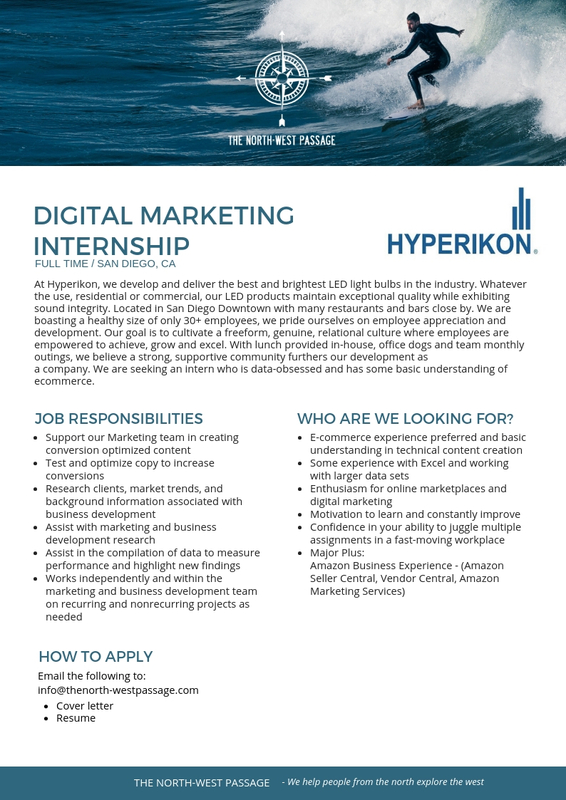 We are currently seeking a full-time digital marketing intern. This role is an ideal opportunity for recent grads with a major in marketing, advertising or a closely related field to gain valuable digital marketing experience in an international environment. CLICK HERE TO READ FULL JOB AD! This is an unpaid internship. However, accommodation and activities are offered at no charge. The accommodation alone will save you $1000-$1500/month as rent is very high in Honolulu. Neurogan is paving the way for a line of nutritional supplement products that promote a healthy body and mind. Our ultimate goal is to help people, and their loved ones, live a happier, healthier life. This position will conduct event planning and tracking. Supporting the Content Manager in creating content for different marketing channels, including social media, website and Amazon listing. ​CLICK HERE TO READ FULL JOB AD! At Hyperikon, we develop and deliver the best and brightest LED light bulbs in the industry. Whatever the use, residential or commercial, our LED products maintain exceptional quality while exhibiting sound integrity. Located in San Diego Downtown with many restaurants and bars close by. With lunch provided in-house, office dogs and team monthly outings, we believe a strong, supportive community furthers our development as a company. 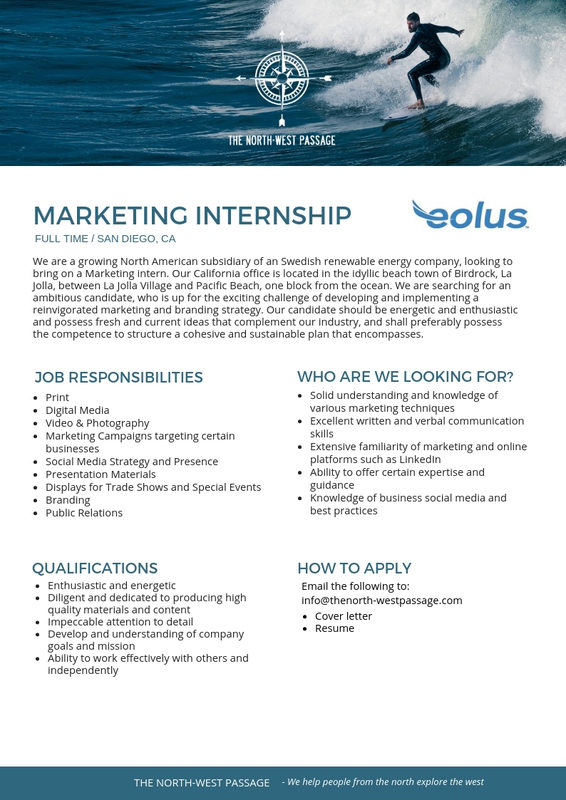 Eolus are a growing North American subsidiary of an Swedish renewable energy company, looking to bring on a Marketing intern. We are searching for an ambitious candidate, who is up for the exciting challenge of developing and implementing a reinvigorated marketing and branding strategy. Our candidate should be energetic and enthusiastic and possess fresh and current ideas that complement our industry, and shall preferably possess the competence to structure a cohesive and sustainable plan that encompasses. Innovate Mobile aims to touch the hearts, minds and lives of product users. Innovate Mobile help startups, companies, smart cities and entrepreneurs design, develop and market mobile and web based application. With our partners and clients, we invent and reimagine technology products and intelligent business solutions through design, development and creative marketing services. The role focuses on learning about and presenting design best practices in multiple industries, engaging in the company's design work through reviews and discussions, and creating various design assets for various projects. CLICK HERE TO READ FULL JOB AD! 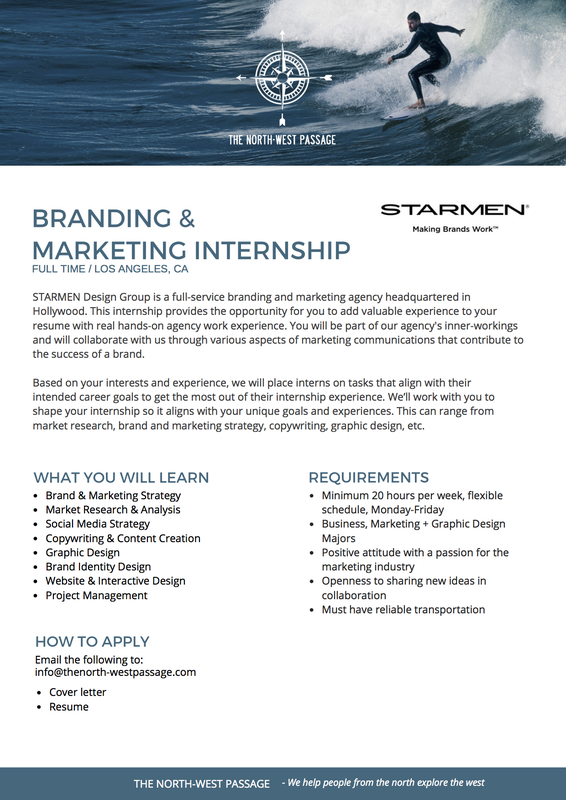 STARMEN Design Group is a full-service branding and marketing agency headquartered in Hollywood. This internship provides the opportunity for you to add valuable experience to your resume with real hands-on agency work experience. You will be part of our agency's inner-workings and will collaborate with us through various aspects of marketing communications that contribute to the success of a brand. Based on your interests and experience, we will place interns on tasks that align with their intended career goals to get the most out of their internship experience. We’ll work with you to shape your internship so it aligns with your unique goals and experiences. This can range from market research, brand and marketing strategy, copywriting, graphic design, etc. Snake Oil Cocktail Company is a boutique cocktail design and consulting firm. The company’s mission is to elevate the craft of cocktails for restaurants, bars and events. 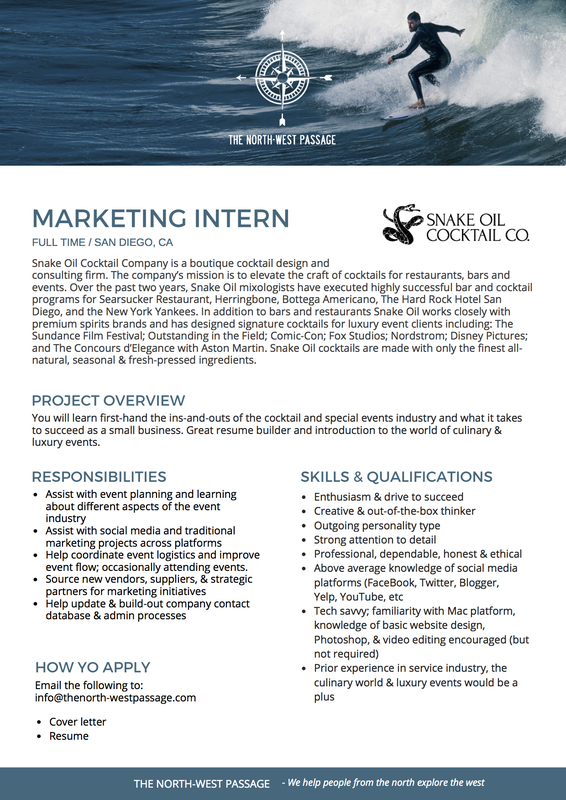 Over the past two years, Snake Oil mixologists have executed highly successful bar and cocktail programs for Searsucker Restaurant, Herringbone, Bottega Americano, The Hard Rock Hotel San Diego, and the New York Yankees. Snake Oil cocktails are made with only the finest all-natural, seasonal & fresh-pressed ingredients. You will learn first-hand the ins-and-outs of the cocktail and special events industry and what it takes to succeed as a small business. Great resume builder and introduction to the world of culinary & luxury events. CLICK HERE TO READ FULL JOB AD! As a Graphic Designer at Raindrop, you’ll design for a wide range of clients from schools to arts organizations to restaurants, dream up campaign concepts and make them come to life, and make even the smallest website banner bring tears to your eyes. We’re looking for a designer who thrives in out-of-the-box thinking, knows the power of a perfectly chosen typeface, and won’t rest until every pixel is in its place. As we’re a fast-paced agency, you’ll need to learn quickly and be flexible, take initiative, and push yourself on both big brand campaigns and small print ads with the same level of care and detail. CLICK HERE TO READ FULL JOB AD! NeuroGym is a world leader in strengthening the mindset and emotional skills so people can accomplish goals faster and easier than ever before. NeuroGym is a live coaching and on-demand training platform where you learn and apply science based methods to overcome your obstacles and strengthen your mindset, so you achieve your goals and dreams faster and easier than ever before. 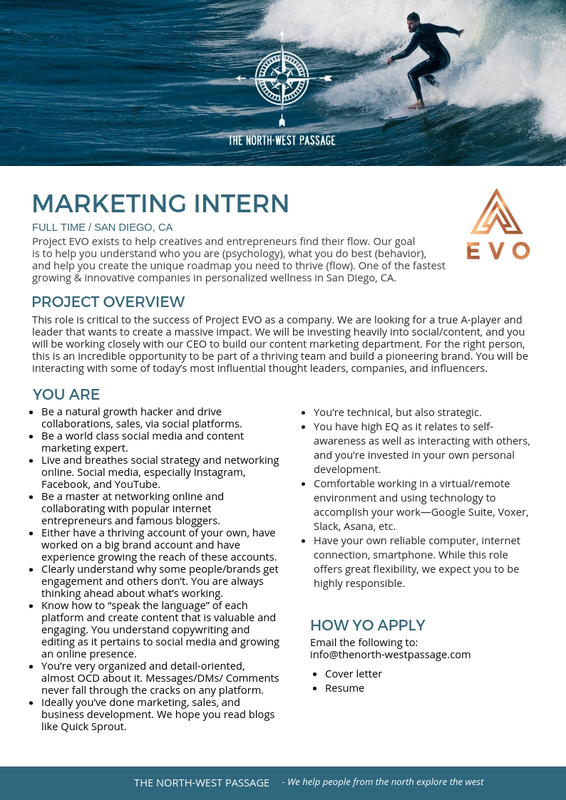 We are seeking qualified interns to help us with marketing our online digital projects. You will join a young, smart growing team that are making a difference in the world with clients all over the world. ​CLICK HERE TO READ FULL JOB AD! Brandetize, currently headquartered in San Diego, CA, is a digital agency that partners with world-class personalities and brands to expand their reach, monetize their business, and leave a positive impact on the world. The Brandetize team has been successfully managing key aspects of its clients’ businesses for over 16 years and continues to grow each year. 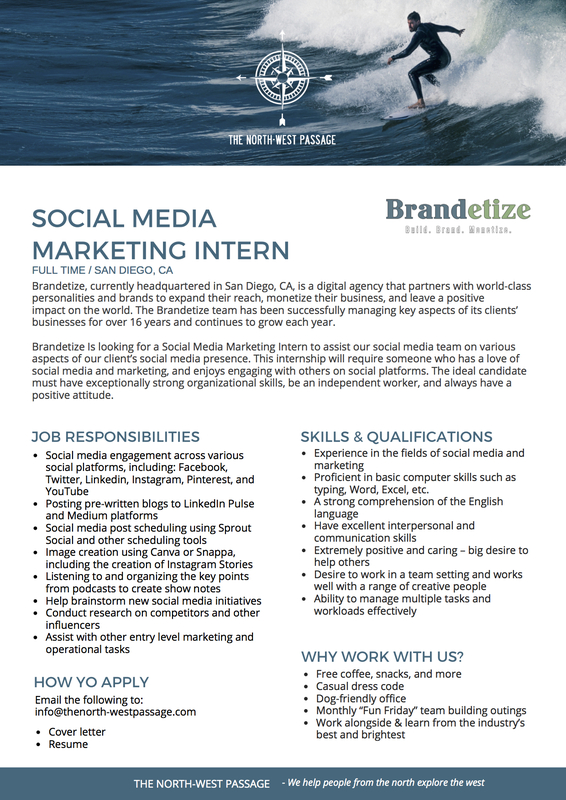 Brandetize Is looking for a Social Media Marketing Intern to assist our social media team on various aspects of our client’s social media presence. This internship will require someone who has a love of social media and marketing, and enjoys engaging with others on social platforms. The ideal candidate must have exceptionally strong organizational skills, be an independent worker, and always have a positive attitude. ​*Applicants are reviewed as we get them, so please submit your application as soon as possible.